CLT consists of layers of dimension lumber (typically three, five, or seven) oriented at right angles to one another and then glued to form structural panels with exceptional strength, dimensional stability, and rigidity. Panels are particularly cost effective for multistory and large building applications. Some designers view CLT as both a stand-alone system and product that can be used together with other wood products; it can also be used in hybrid and composite applications. CLT is well-suited to floors, walls, and roofs, and may be left exposed on the interior for aesthetics. Because of the cross-lamination, CLT also offers two-way span capabilities. CLT can be manufactured in custom dimensions, with panel sizes varying by manufacturer. There are several CLT suppliers in North America, with more anticipated. The species of wood used depends on the manufacturing plant location. The 2015 International Building Code (IBC) and 2015 International Residential Code recognize CLT products manufactured according to the ANSI/APA PRG-320: Standard for Performance Rated Cross-Laminated Timber. Under the 2015 IBC, CLT at the required size is specifically stated for prescribed use in Type IV buildings. 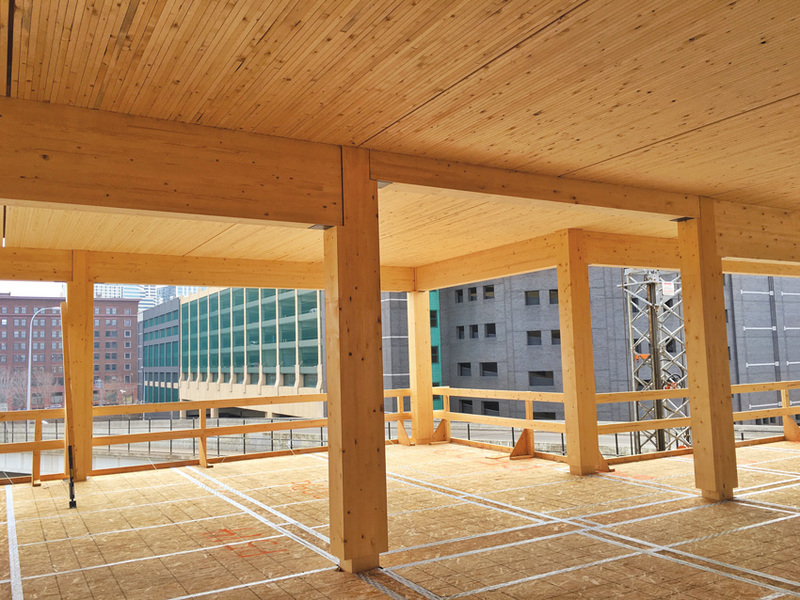 However, CLT can be used in all types of combustible construction—i.e., wherever combustible framing or heavy timber materials are allowed. The National Design Specification® (NDS®) for Wood Construction is referenced throughout the IBC as the standard for structural wood design, including CLT. The 2012 IBC does not explicitly recognize CLT, but the 2015 IBC provisions for CLT can be a basis for its use under alternative method provisions. For more information on CLT, the U.S. CLT Handbook is available as a free download at www.thinkwood.com. 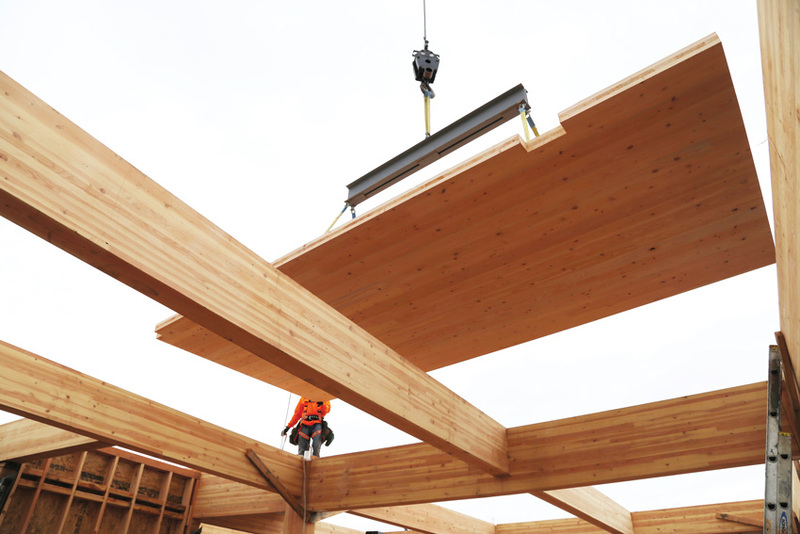 The four-story, 16,000-square-foot Albina Yard is noteworthy for being the first commercial building in the United States to use domestically fabricated CLT as a structural element. A Type III project designed under the 2014 Oregon Structural Specialty Code, it is also interesting as a precursor to another LEVER-designed office project—Framework, the 12-story winner of the U.S. Tall Wood Building Prize Competition. Currently in design, Framework will consist of ground-floor retail, five levels of office space, five levels of housing, and a rooftop community space. It is expected to include CLT floor panels as well as a new system of post-tensioned rocking wall panels. Developed for use in high seismic regions, rocking mass timber shear walls were tested by the Network for Earthquake Engineering (NEES) as part of its CLT Planning Project. Seismic activity was simulated by cyclic loading that pushed and pulled the top of a 16-by-4-foot CLT panel with an embedded vertical pretensioned rod into a rocking motion. The wall was able to reach 18 inches of displacement, while maintaining its ability to self-center back to a vertical position. Framework, which is scheduled for completion in 2018, is expected to be the first application of a rocking mass timber shear wall system in the United States. 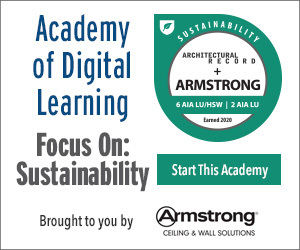 NLT is created from individual dimension lumber members (2-by-4, 2-by-6, 2-by-8, etc. ), stacked on edge, and fastened with nails or screws to create a larger structural element. NLT is far from new—it’s been used for more than a century—but is undergoing a resurgence as part of the modern mass timber movement. Commonly used in floors, decks, and roofs, it offers the potential for a variety of textured appearances in exposed applications, and wood structural panels can be added to provide a structural diaphragm. NLT has also been used to create elevator and stair shafts in midrise wood-frame buildings. NLT naturally lends itself to the creation of unique roof forms. Because panels are comprised of individual boards spanning in a single direction, both singly curved and freeform panels can be created by slightly offsetting and rotating each board relative to the others. This allows the complex geometry of curved roof and canopy structures to be realised with a simple system. Advantages of NLT include the ability to use locally available wood species and the fact that specialized equipment generally isn’t necessary. An NLT system can be created via good on-site carpentry, though some suppliers do offer prefabrication, and this can have benefits depending on the scale and complexity of the project. Prefabricated NLT panels typically come in sizes up to 10 feet wide and 60 feet long, with wood sheathing preinstalled. When detailing NLT systems, designers need to account for moisture movement. The IBC recognizes NLT and provides guidance for structural and fire design. No product-specific ANSI standard is required, as the structural design of each element is covered by the NDS and applicable grading rules. NLT can be used in all types of combustible construction. Designed by MGA, the seven-story T3 building in Minneapolis, Minnesota, includes glulam columns and beams, and NLT floors. Glulam is composed of individual wood laminations (dimension lumber), selected and positioned based on their performance characteristics, and then bonded together with durable, moisture-resistant adhesives. The grain of all laminations runs parallel with the length of the member. Glulam has excellent strength and stiffness properties, and is available in a range of appearance grades for structural or architectural applications. While typically used as beams and columns, designers can use glulam in the plank orientation for floor or roof decking. With careful specification and design that considers the flatwise structural properties (see APA reference below), deep glulam sections can be placed flatwise as decking similar to NLT. With the flexibility of glulam manufacturing, glulam ‘panels’ can be used to create complex curvature and unique geometry. When used in such innovative floor and roof panel configurations, glulam is seen as an extension of the mass timber product family and sometimes referred to as GLT. The IBC recognizes glulam products manufactured in conformance with ANSI Standard A190.1-2012: Standard for Wood Products—Structural Glued Laminated Timber. For more information, consult the Glulam Product Guide available at www.apawood.org/glulam.